The name of these mountains comes from the blue tinge the range takes on when viewed from a distance. The tinge is caused by electromagnetic radiation which occurs when incoming ultraviolet radiation is scattered by particles within the atmosphere creating a blue-greyish colour to any distant objects. It is widely, but incorrectly, believed that this is created by light reflecting off vapours from eucalyptus leaves. European settlers initially considered that fertile lands lay beyond the mountains, as was China in the belief of many convicts, but that this didn’t matter much, since the mountains were impassable. We visited the Blue Mountains months ago, during local late autumn. If you have strong legs, and shoes different than flip flops (yes, there were many tourists walking on these massive rocks with flip flops or thongs as the Aussies call them), there are great walking tracks down a cliff, there are amazing waterfalls and good photo opportunities, such as the view of the Three Sisters. 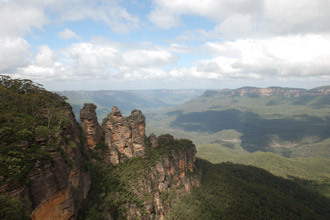 There are also typical tourist attractions, such as the Katoomba Scenic Railway. Well, I guess the choice is yours. I was reading the other day about a $125 million six star eco-retreat that has just been built by Emirates in the Greater Blue Mountains which looks amazing. It’s been modelled on the Al Maha Desert Resort in Dubai. It’s called “Wolgan Valley Resort” and looks awesome, just a little out of my price range at nearly $2000 per night though. I am looking all over the web for nice places to book for a weekend at the Blue Mountains and am hoping to maybe write a review on them. I’m currently looking at bilpinsprings.com.au and they seem to have some nice offerings. If anyone knows or has had an experience with them It would be really helpful.